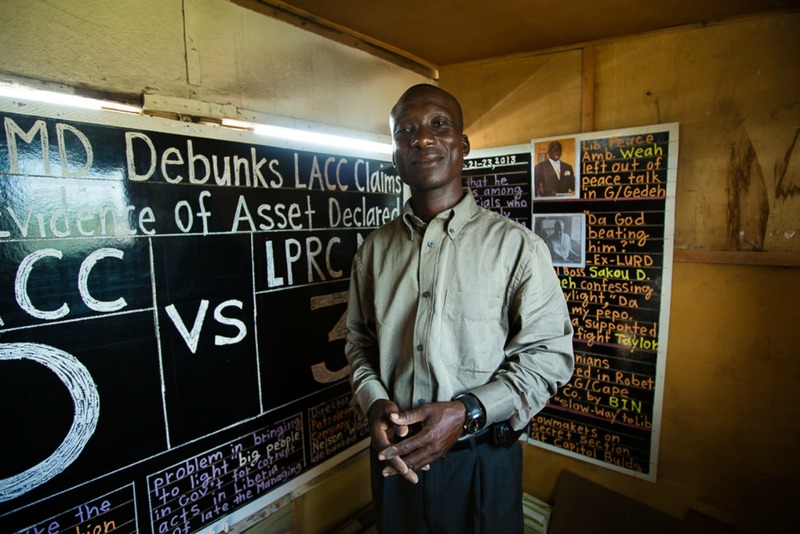 Two advocates in Liberia and Sierra Leone demonstrate that good governance must come from within. Twitter, Facebook, Reddit, Instagram, YouTube, blogs...are you overwhelmed by the massive amount of information coming at you? What if there was a way to continually sort through and make meaning of the vast amount of local news, national and international media, so that you could always get the best and most relevant content to you? What if this highly-valued, curated information-sharing platform was in the middle of your town or city? Near one of the busiest intersections? What if it was written not on a screen, but on a blackboard? If you live in Monrovia, Liberia, it is. The Daily Talk is a convenient way that 5,000 people on average each day use to consume their news—more people than those that read Liberia’s most popular website. During the Ebola crisis, the news is not just bits of information. The news has become a matter of life and death. Alfred Jomo Sirleaf has been at the forefront of making sure people have this crucial information. 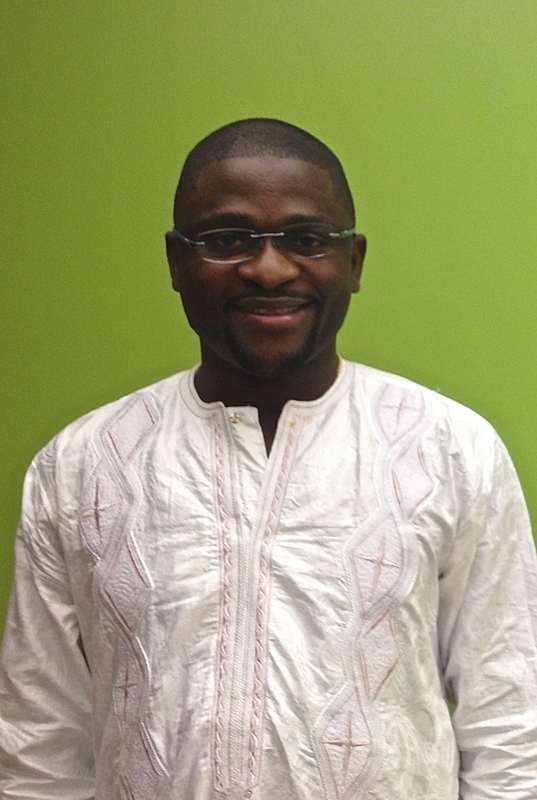 Since he founded The Daily Talk in 2000, the 41-year-old father of three, inventor, and high school graduate has been on a personal mission to provide free news on local, national and international issues to his fellow Liberians. On Tubman Boulevard, at one of Liberia’s capital’s busiest intersections, sits a white plywood shack. Every morning, with just four other staff and very little and inconsistent funding, Sirleaf checks in via text with “eyes and ears” correspondents, or over 200 volunteer citizen journalists across all 15 of Liberia’s counties. They scour over a dozen newspapers, radio reports, international media, and government websites. Sirleaf then decides which three to four stories and headlines will appear on the shack’s “front page,” and writes them up with weatherproof chalk in the small, dark newsroom behind the rotating blackboard. Sirleaf writes in Liberian English, a pidgin or vernacular that is readily understandable to people, and tapes up photos he has printed out from the nearby Internet café to illustrate stories. He has also devised a system of symbols that enables people who don’t read well to know what today’s main story is about. People can see the bottle of dirty water hung by the shack and know that oil prices are in the news. If it’s a blue helmet, readers know it’s the UN peacekeepers. For stories about embezzlement (or “big stealing” in the colloquial), it’s a broom to signify “cleaning house.” A metal hubcap signifies a story about the “iron lady” of Liberian politics, Liberia’s Nobel Prize winning President Ellen Sirleaf Johnson (no close relation to The Daily Talk founder) who passes by the shack everyday in transit from her home to her office at Liberia’s Ministry of Foreign Affairs. Those who can read often do it aloud for their friends that can’t and these “props” or symbols enable people walking by to have conversations with those gathered at the shack, thereby breaking down barriers for people of all ages, classes, and education levels to engage in the issues of the day. “Without paying a dime, all you need to do is go closer and somebody can help you understand what is happening,” Sirleaf explains. The ability to reach people in ways most relevant to them became even more crucial when Ebola hit Liberia last year. “I started in April. I was covering Ebola when it was still at the border, near Guinea,” says Sirleaf. “I was scoring the government on its health care facilities, response to the epidemic, communications to the public, lack of preventative systems, etc. “Daily Talk is about keeping everyone in the system on their toes and aware of what is happening,” he says. Sirleaf’s work—before, during, and after Ebola—aims to fuel active citizenship so that people are able to turn to politics and debate, rather than armed conflict, in the face of adversity. This is because of his firsthand experience of the atrocities of war and oppressive dictators. In addition to losing family and friends in the war, the Taylor regime jailed and exiled Sirleaf, and tore down The Daily Talk shack twice. Sirleaf claims that The Daily Talk’s coverage of the government’s response to Ebola moved them to take more active measures, constructing emergency treatment units around the country and supporting other preventative services. “I think the scorecard of The Daily Talk prompted action [on Ebola] by the government as it was seen worldwide. We exposed government weaknesses,” he explains. In the three major Ebola-affected countries, citizens that want access to up-to-date and accurate information from their government to hold government accountable are often met with unclear procedures, disorganized records, and uncooperative officials. Forward to mid-February when the Sierra Leone government’s audit service slammed the Ebola expenditure process as grossly violating procurement laws and procedures. Robtel Neajai Pailey PhD, a Liberian writer and researcher at the University of London, describes a “crisis of citizenship” that Ebola makes more acute. “Relations between the Liberian state and its citizens were already volatile…indicative of the desperation of poor people who have seen the state fail them repeatedly,” he writes. Both champions of free expression and information, Sirleaf and Abdulai’s existing, day-to-day work to build accountability in their countries intensified to fight against misinformation during the Ebola epidemic. At the point at which rumors are rife and a kind of chaos ensues, both men agreed that this is when people’s willingness to trust in their government is crucial. “People wanted to know what was happening - how serious the outbreak was, the 'real' fatality and infection rates, and how fast it was traveling in Sierra Leone,” says Abdulai. Luckily Sirleaf had expanded the scope of The Daily Talk billboard’s content. In 2013 they began to include a section with step-by-step instructions on how to navigate government services, such as how to register a business, obtain a birth certificate, get a new passport, or submit a Freedom of Information request. This section could directly serve people’s information needs about Ebola. In recent months, the civic education section of The Daily Talk has covered the location of hospitals and Ebola treatment units in Monrovia, best practices on sanitation and hygiene, and how to report suspected Ebola cases. And what is the symbol Sirleaf uses for the deadly disease? 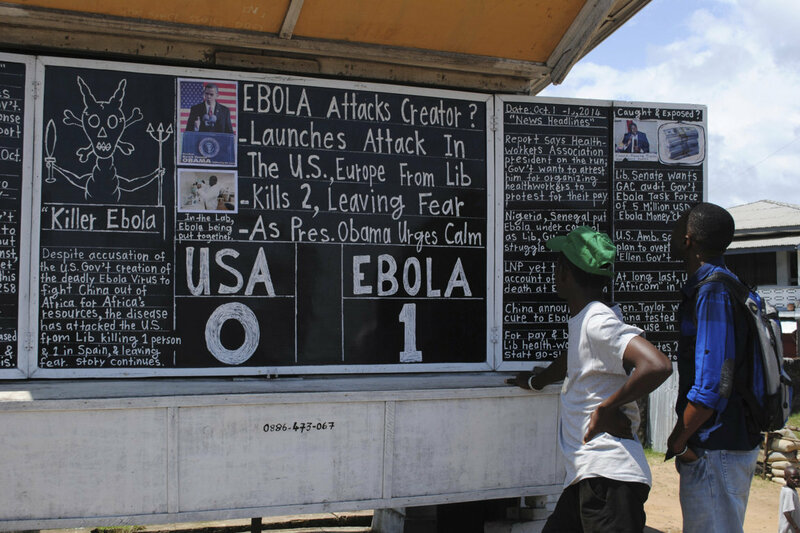 How does he portray Ebola to help people make sense of it? This story is part of an Oxfam series that highlights local leaders who are standing up for accountability, making demands of their government, and getting results in the fight against injustice. Though Oxfam may not fund every project or organization featured in the series, Oxfam stands in solidarity with all those around the world working to right the wrong of poverty.